Students will become adept at working with the handgun from the holster, including drawing safely, efficiently, and quickly, and safely re-holstering. You will learn to shoot quickly and accurately, fire multiple shots with full control and will learn to reload the pistol quickly and efficiently using both speed reloads and emergency reloads. Students will learn to shoot effectively with one hand, using the dominant hand and the non-dominant hand. We will work on mental conditioning to prepare the student to effectively deal with a sudden threat to their life or the life of another. Strong Side Holster – For safety reasons on the range our classes will use Strong Side Holsters only! - (No cross draw, shoulder rigs, pocket holsters, ankle, appendix or small of the back carry). Blackhawk Serpa and similar holsters which require the use of the index finger to deactivate a retention device will not be used in SAFTD classes. The ONLY exception is for Law Enforcement & Military who are issued these types of holsters for duty use. You need to be proficient at this task and have a holster that does not collapse when the gun is removed. No pocket guns such as Keltec PF9, Ruger LCP etc. You will be presenting the gun from concealment and re-holstering repeatedly. 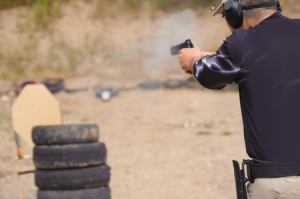 The Defensive Handgun 2 course length is a full day, typically taking 8 – 10 hours including a scheduled lunch break. A short break is given after each hour of instruction (approximately).